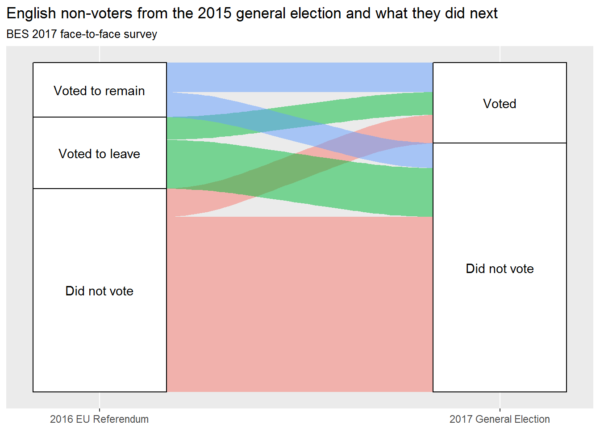 This is the third and final part of my preliminary analysis of groups of voters defined by the choices they made in the 2015 general election, the 2016 European Union membership referendum, and the 2017 general election (c.f. Stephen Bush’s nine voter groups), using an English subset of responses to the British Election Study’s post-election face-to-face survey. In the first part, I looked at the ten largest groups, from Conservative-Leave-Conservative to Conservative-Remain-Labour, both in terms of their size and in terms of their self-declared likelihood to vote for various parties in future, and found that Labour Remainers were not only more numerous but (on their own assessment) more likely to be poached than Labour Leavers, while the smaller group of Conservative Remainers who had switched to voting Labour were quite likely to switch again. In the second part, I looked at six groups of voters who had in common that they could have voted but did not in the 2015 general election, finding that most of them did not vote either in the 2016 referendum or the 2017 general election, and that only the minority who voted Remain in the 2016 referendum were more likely than not to have voted in the 2017 general election. 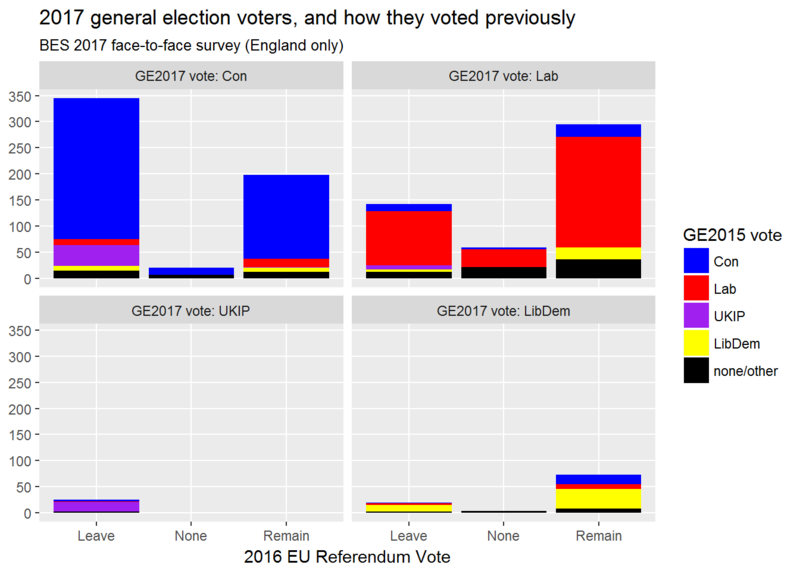 On Friday, I posted some analysis of groups of English voters defined by the combinations of choices they made in a succession of votes. That was the first installment of a multi-part response to Stephen Bush’s recent article on why we should stop focusing so obsessively on people who voted Labour in 2015 and then voted to leave the European Union in 2016. I’d now like to take a look at those who didn’t vote at all in the 2015 general election. Like many, I read with interest Stephen Bush’s recent article on ‘The nine voter groups who are more important than Labour Leavers’. If Bush were a grant awarding institution, there would be money available for researching those groups. Well, he isn’t, so there isn’t, but I like a challenge so I’m going to make a start anyway – using open data from the British Election Study (henceforth, BES). To be more specific, I’ll be using the BES 2017 face-to-face survey, which was conducted after the election and uses what should probably be considered a more genuinely random sample than the online waves. The findings of wave 13 of the British Election Study are now out. Wave 13 was conducted just after the June 2017 General Election, and analysts all over the country have been crunching the numbers. This is my contribution, and looks at answers to the question, ‘As far as you’re concerned, what is the SINGLE MOST important issue facing the country at the present time?’ This was a free text question, so respondents were able to provide whatever answers they wished, without restriction. What I wanted to find out was whether people of different NRS social grades would express different concerns in their answers to this question. We already know that Labour gained vote share from the Conservatives in more middle class areas and lost it to them in working class areas. 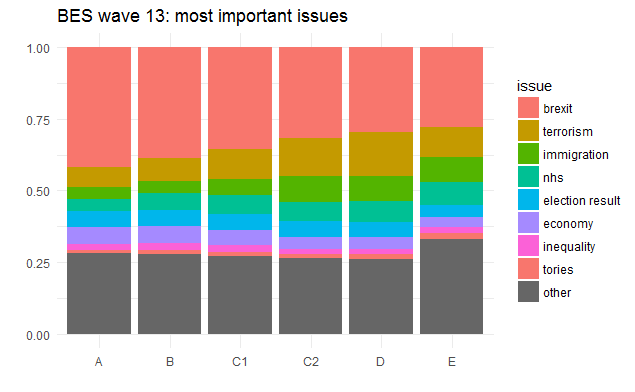 Might analysis of those ‘most important issues’ give a hint as to the different priorities of people of different social classes? There’s much to be said about the UK’s decision to leave the European Union and the US’s decision to elect Donald Trump as president: above all, that we have in neither case seen a simple victory of ‘right’ over ‘left’. Leading conservatives in both countries had opposed the result that ultimately came to pass, and in both countries, the result was followed by a stock market fall, indicating that investors expected the supposedly ‘right wing’ option to be bad for business. But for now I’d like to observe some important transatlantic similarities in the demographics of the winning and losing sides. In a few days’ time, my country will hold a referendum on whether to stay inside the European Union or to leave it. I am fairly convinced that the outcome will be a victory for the ‘leave’ camp. London and Scotland will vote to stay in, the UK as a whole will vote to leave (led by those parts that have benefited most from EU membership), and a second referendum on Scottish independence will probably follow, in which case Scotland will almost certainly vote to leave the UK in order to stay in the EU. England will be left behind with the relatively impoverished Wales and Northern Ireland – both of which will lose their EU funding, as will the economically marginal parts of England that the London-based government will continue to do its best to ignore, as it has done for many years.